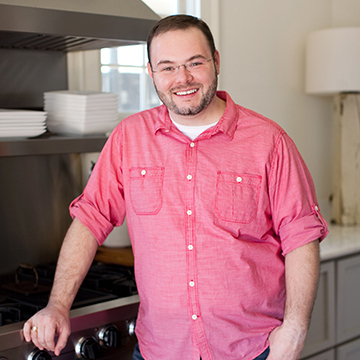 I’m so excited to introduce you guys to the newest appliance in the Southern Bite Test Kitchen – the Kenyon City Grill. This little baby is American made and is the perfect option for apartment dwellers who can’t have an open flame on balconies. 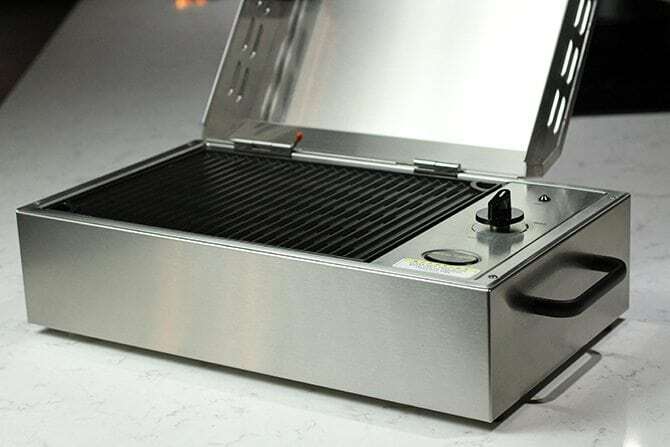 For me (and probably you, too), it’s also the perfect indoor grill because the enclosed heating element creates virtually no flare ups or smoke. No, this isn’t my mother’s old indoor grill. This thing is a beast. It’ll get to 500°F in about 5 minutes, so you’ll get all that great grilled flavor and char, but without having to brave the weather or deal with the smoke inside. The BEST part of this baby is the clean-up. The nonstick grate is dishwasher safe and the aluminum drip pan below is disposable. 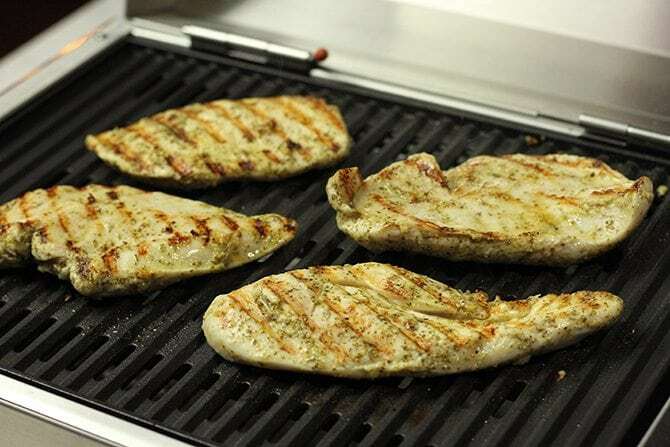 Easy grilling and easy clean-up: it’s a win-win! 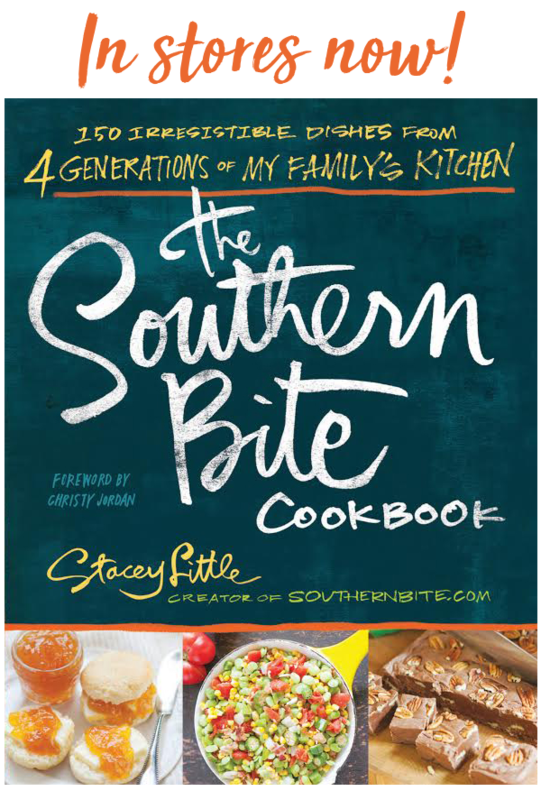 My friends at Kenyon are offering all Southern Bite readers an amazing deal right now. You can get $75 off the price of the Kenyon City Grill by using the promo code “SouthernBite” (without the quotation marks) at check out. It would make an amazing gift this holiday season and the great discount makes it even more affordable. 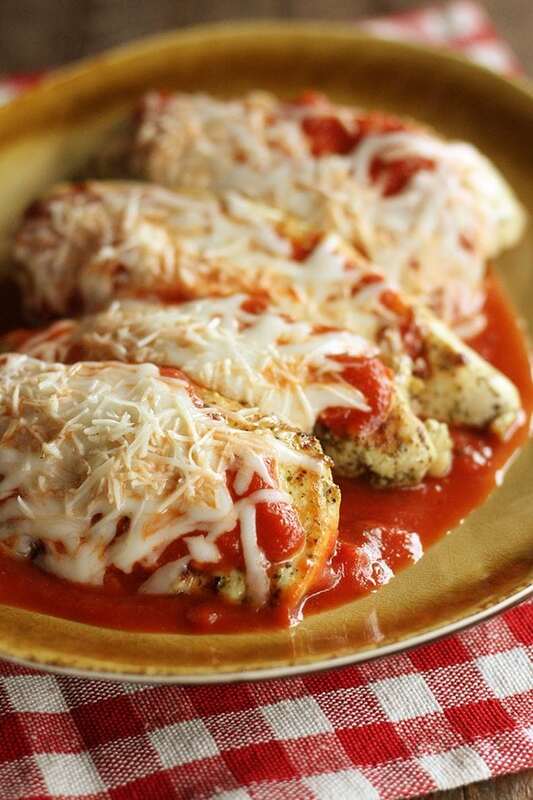 Now, this Grilled Chicken Parm is an amazing way to test out your new City Grill. 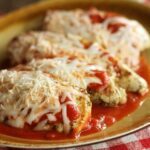 It has all the great flavor of traditional chicken parm (basil, garlic, parmesan, tomato) but is lightened up a bit and has that great grilled flavor. AND it only calls for 6 simple ingredients! Who can beat that? Grill this up and serve it alongside some pasta or mashed potatoes and a simple salad for a super easy and quick dinner. My family just devoured this stuff. In a gallon-size zip top bag, combine the chicken, pesto, garlic, and a sprinkle of salt and pepper. Close the bag and shake the coat the chicken in the pesto and garlic. Allow to marinate for at least 30 minutes but up to 4 hours - in the refrigerator. 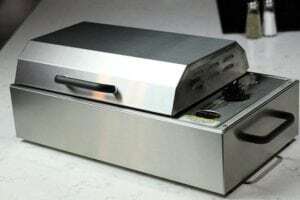 When ready to cook, preheat the grill to medium-high heat. Add the chicken breasts and cook for 4 to 5 minutes* on each side. 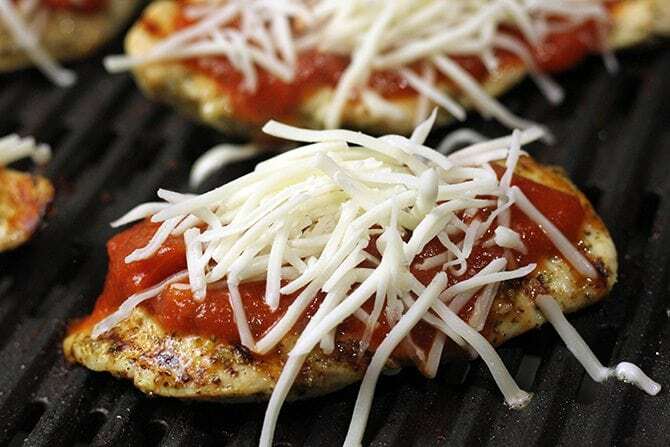 Spoon a generous tablespoon of marinara over each checking breast and top with the mozzarella and parmesan cheese. Close the lid and allow the cheese to melt. 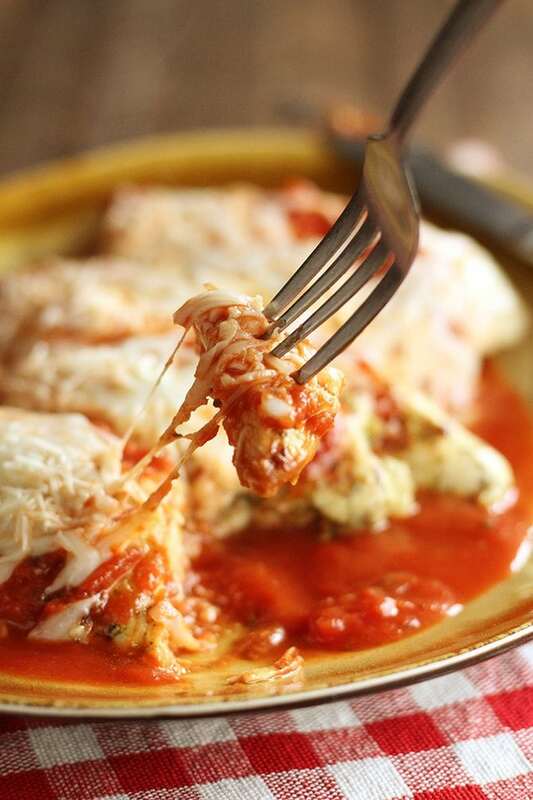 Pour the remaining marinara over the bottom of a serving dish and layer the chicken on top once it is cooked through. 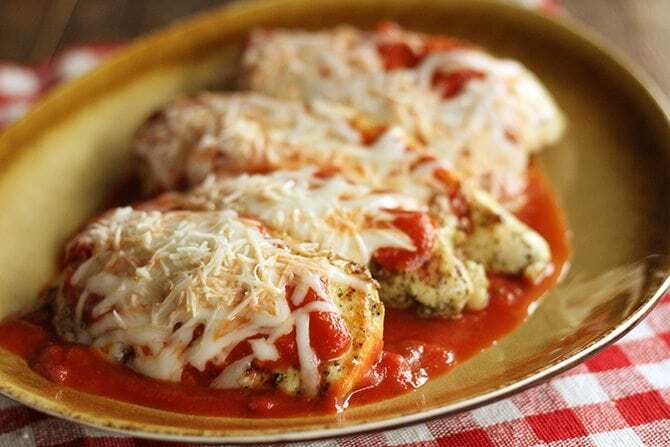 *The cook time of the chicken will vary based on the thickness of the cutlets. I always suggest using a meat thermometer to ensure that the chicken reaches an internal temperature of at least 165°F to ensure doneness. This post is sponsored by my friends at Kenyon International, but the thoughts and opinions are all my own.